Hello Exiles and welcome to my very first guide! With the introduction of the new Vixen's Entrapment Gloves and the new Skill Gem Bane I have been thinking of making an occultist support that does not rely on blasphemy to apply it's curses and therefor has more space to run more Auras. Very simple the Build relies on the use Bane to apply all its linked curses. While Vixen's Gloves are used for the +1 Curse and the ability to automate up to 4 more curses socketed in them. Bane itself is considered a curse skill which will Apply it's own curses AND trigger all curses socketed in the gloves. This interaction allows us to cast multiple curses at once and dropping the need for blasphemy. Which then free up more mana for us to run as mana auras as we can fit! + Very Active Game play, casting Bane to Curse Packs and Bosses as opposed to just running around makes you feel more part of the action and gives you something more to do. + We Run almost every single DPS Aura + 3-4 DPS Curses carrying any pleb no damage MFer. + Adaptable damage support by swapping Auras and/or Curses depending on carry/group. + Hexproof enemies have nothing on us thanks to Profane Bloom. + Free Stun immunity and Sustain thanks to Occultist Ascendancy. + Easy high ES Pool. + Victario's Influence + CI for no need of Coruscating Elixir feels amazing. + Cost can be scaled down easily with going LL BM or removing 1Aura or Aspect of the Spider. + With investment can have a zero mana Flame Dash with very low CD. + Lot's of upgrade paths and min-maxing potential if you so chose. - Apart from Purities and Curses you provide no other Defensive Auras. - The Build can get expensive quickly if chosen to go CI. - You do not provide the 70%+ Attack and Cast speed that a Scion Aura bot provides. - You do not provide 18%+ Physical Damage Reduction that a Scion Aura bot Provides either. - Dex is hard to get by since you're tight on Passives points. - No Room for gem setups such as CwDT. - No Regen maps are extremely bothersome. A lot of it. Every Aura effectiveness node + 6 DPS Auras + Generosity Level 30 + DPS Curses! Here's a Jewel you can copy past into PoB which has all the current bonus my Curse bot gives. BUT WAIT THERE'S MORE! Malediction also reduces the damage enemies we curse deal while they also take 10% increased damage! For a budget/starter setup we will be going using Blood Magic Keystone and the Notable Behind it 'Mortal Conviction' for its "50% Less Mana Reserved" Allowing us to reserve a lot of auras on our life with not much cost to our gear! For our chest piece we are going to be going for Victario's Influence. This Chest provides insane amount of Reduced mana Reservation to socketed gems on top of Global Aura Effectiveness AND Level 30 Generosity. 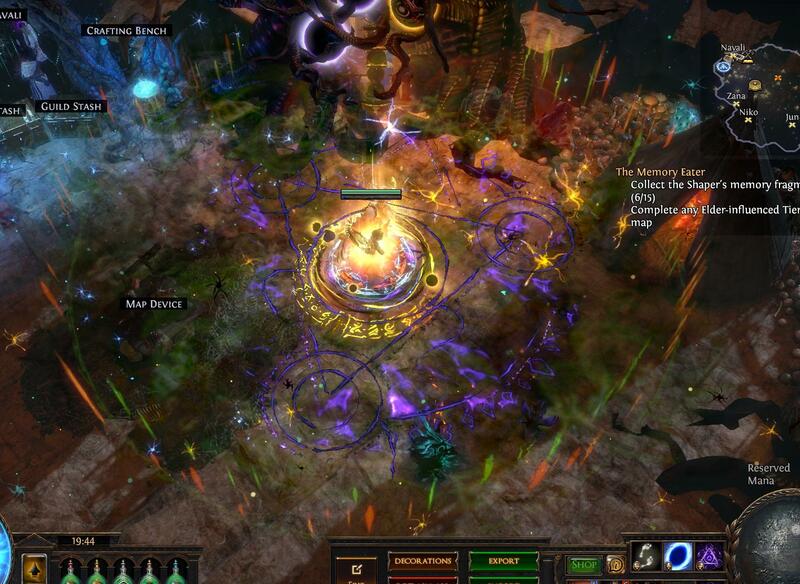 This is where we will be placing or 50% DPS auras since we do not need to be affected by them. You do not need a 5L nor do you need Enlighten or Empower a 6socketed one will be just enough for starting off! Prism's Guardian is a very cheap shield that provides massive RMR to its Gems on top of giving them +2! and some well needed Dexterity (trust me you'll be wanting all the dex you can get) In This shield we will be socketing the rest of our Big Auras, such as Haste, Purity of Elements and Vitality. No much question here, our build revolves around the Vixen's Gloves and they allow us to automate all socketed curses. We will be socketing 3-4, The Cast speed doesn't matter we will have ample enough of cast speed so try to get as high es as yo ucan afford. Since we do not need to do damage as an Aura bot, Ephemeral Edge is good cheap option that will give a great amount of ES. We can later upgrade to a rare crafted Tiger Hook with "Auras From you Skills Grant 2% Increased Damage to you and Allis"
We have 2 possible options for Boots, Steppan Eard or Sin Trek, if you want more survivability I recommend Seppan's immunity to desecrated ground is a big QoL, while Sin Treks also provide great ES and help with our DEX. A Rare belt with some Chaos Resistance will do just fine, but you can also use a Bated breath for high Energy shield, especially if you can get one with Discipline Aura Effect Corruption. For Rings we want at least 1 Doedre's Damning ring for the additional curse, your second ring can be another one if you want 6 curse or it can be a unset ring with ES and +Socketed Gems for a higher level discipline. For an Amulet any Rare Amulet with as much flat Energy Shield and % Energy shield as you can afford, try to get one with Chaos Resistance if you can and an open suffix to craft Aspect of the Spider if you so wish. For Flasks you can use any flasks that you want/prefer but you need at least 1 Coruscating Elixir. Remember that solve Bleeding, Ignite and Shock with flask as well! There are 2 Required Jewels Conqueror's Efficiency and Potency, these are also the first Jewels you should focus on getting with 1%RMR corruption if you so wish to upgrade to CI later on. As for Rare Jewels Any Jewel will work as long as it has some of the following ES, Int, Dex, Chaos Res. Try to get Abyss Jewels with Flat ES instead of of Regular Jewels with %ES for more ES. Get anything you feel will help you and your play style and within your budget! Personally i love the Cooldown recovery speed of movement skills while affected by haste for a better flame dash experience. You may also get a Chaos Resistance while Affected by Purity of Elements if you are struggling in that department. You can put All Damage Aura Gems in here with Smite, however since most builds wont actually scale with All auras you can usually drop an aura and link the rest to Empower if you have a 4 to 6-link, Just be mindful of your Reservation. 5 of the following: Wrath, Hatred, Anger, Malevolence, Zealotry , Empower. Assassin's Mark, Frostbite, Ele Weakness, Poacher's Mark, Conductivity, Flammability, Projectile Weakness, (warlords mark?). Socketed any movement speed skill setup you would like to use here! Level 100 Tree: Finish up by taking as many Jewels Sockets as you can. First off why would an Aura bot want to go CI? Pretty simply it's a huge quality of life. Since we are going to be using Victario's Influence we have no way of protecting ourselves from chaos damage out side of Coruscating Elixir while also needing to get Chaos Resistance in our gear. When going CI we completly nullify the downsides of Victario's Influence over Shavs. Alright so on earth can we reserve so many Auras on mana with out the "50% less Mana Reserved" node behind Bloodmagic? We need a LOT of "%Reduced Mana Reserved" for our Auras and theres 4 key things that are required before we can make the swap. Before we get into the gear required to go CI we should understand that this is NOT cheap compared to the LL variant. This would likely cost you at the minimum 4-5 exalts so if this is out of your budget you should stay Lowlife! We are only getting these Boots for the 6% RMR they provide while the little bit of ES they give is nice. Theres no way around having this boots for us and are REQUIRED to go CI. 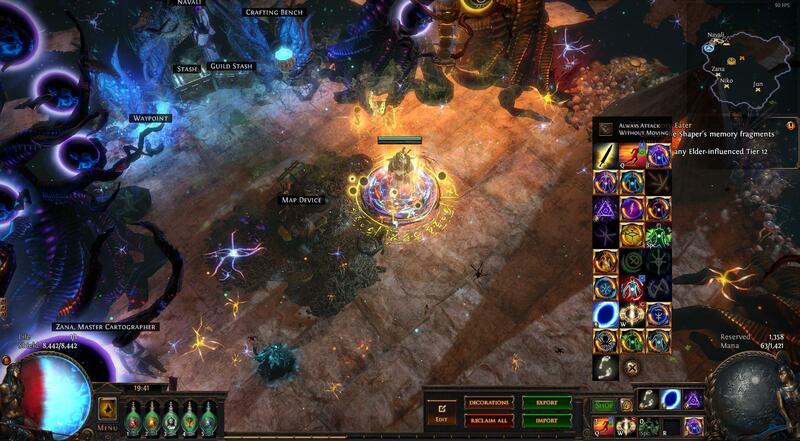 Since we are CI we cant use Prism Guardian anymore since socketed gems have bloodmagic. There for we will need a replacement, being a Rare Shaped Shield (Prefferably) Titanium Shield, Roled with "15% RMR of Socketed Gems"
It is not as strong as the 25% from Prism Guardian but it will do the job just as well for us while also providing potentially much more ES! You can get one already rolled with Low ES for very cheap on poe.trade or craft your own by Alteration Spamming until you can hit the Suffix 15%RMR of socketed gems, then regal and craft ES on it. We are gonna need a 5%RMR Amulet, for the same reason we are getting skyforth for its %RMR we are getting an amulet with the same to further reduce the amount mana our auras reserve. 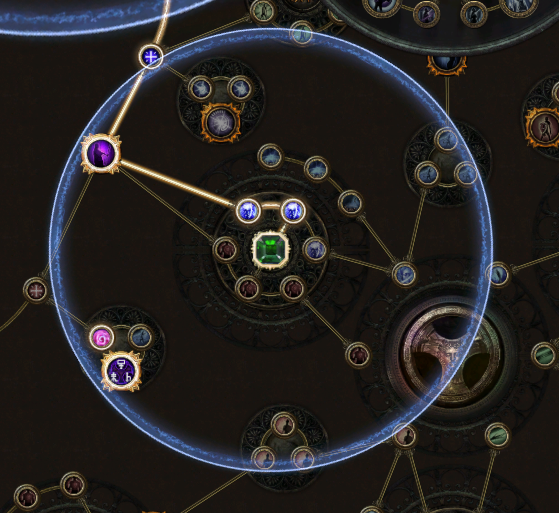 There are 2 ways to get RMR on your amulet, the first is on Shaper Amulet since it is a mod that can roll on those, and the second is as an implicit via synthesis league! You can either buy one straight out (synthesized ones go for about 1~1.5ex) or you can alteration spam a shaper amulet until you can get the mod then Regal and protentially craft % increased energy shield. This is the last thing we need and is the more annoying and most tedious part. Jewels. And not just any kind of Jewel we need as many Jewels with the newly introduced coruption in 3.3 "1% Reduced Mana Reserved" and we need as many as we can get. You will need atleast 4 of them to swap to CI. I recommend you get the following 3 as a priority. Conqueror's Efficiency, Conqueror's Potency, Intuitive Leap. How to get Jewels like this? Personally I dont recommend buying rare jewels with corruption, Rares with ES alone + Corruption sell for 2-3 exalts depending in the ES roll. Instead I recommend you craft your own ES jewels and corrupt them yourself, just Alt until you can hit ES, Regal and Vaal for your jewels it will take some time but it will cost infinitly cheaper! While you wait to hit your corruption you can use Cheap Jewels like Careful Planning/Fluid Motion or whatever cheap jewel with the corruption you can find. We are still and always will be using this chest. Here we can either stick with an Alpha's Howl OR once we get enough %RMR Jewels we can upgrade to a rare helmet with a helmet enchant. For such a helm you want to buy a itemLevel 84 Hubris Circlet with "Haste has 15% reduced mana reservation" enchant. Then to get the 5% RMR suffix you want to craft the helm using Bound Fossiles until you can hit the 5% mod as well as a decent amount of ES (use dense fossils as well if yo ucan afford). Get an Aura Effect Corruption if you can afford it. Still thae same gloves since out build revolves around them, if you can you can get an upgrade by getting a +2 AoE or Curse Corruption. Any Belt will do honestly Crystal Belt, Stygian Vise, Darkness Enthroned or Bated breath. Each have their own upsides. Darkness Enthroned: Allows us to fix our Dex problems more easily and have more Jewel Slots for 1%RMR jewels allowing us to cheap out on some jewels. 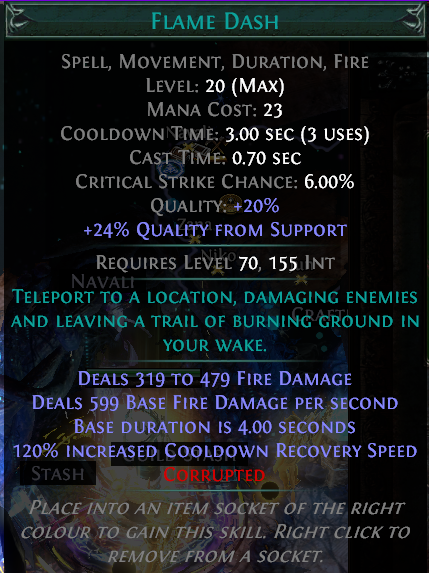 You have 2 options here, More Energy Shield with Ephemeral Edge or a Rare Weapon (Usually a Shaped Tiger Hook) with the Delve Suffix 'Auras from your skills grand 2% increased Damage' paired with the Shaper Suffix 'Socketed Movement Skills have no mana cost'. If you want a Low CD Flame dash that you can spam (even in no regen Maps) you should go for the Tiger Hook. You can craft such a Weapon by using Bound + Lucent Fossils until you can hit both mods togheter. It can take a lot of tries however but it is a very nice upgrade to get. For Gem Setups you have many different options depending on the Auras you want to run, how much 1%RMR Jewels you have and if you are running disciplining in ring or not. 4 of the following: Wrath, Hatred, Anger, Malevolence, Zealotry . You can use any flasks you want and swap them depending on the content you are doing. So get suffixes that apply to the ailments you need/want to cover. Good flasks to have are: Ruby, Sapphire, Topaz, Quicksilver, Basalt, Silver. Pick 5 adapting to the content you are doing. The Tree is very simple, we are taking every Aura and Curse Node. We also want CI, Some ES, and Faster ES Start(to help us sustain) and the closest most efficient jewel sockets. When Swapping from LL you will be unspecing Bloodmagic, Acrane Vision then taking Chaos Inoculation, saving you 4 passive skill points! I then respected my Tree and went LL-BM Victario's with Elixir until i had enough RMR to swap to CI Use Alpha's Howl until you can use a Rare Crafted Hubris with 5% RMR and Haste enchant. Level 75 (Make sure you have a Conqueror's Efficiency socketed. -How Many %RMR do I Need to go CI? That depends on how many Auras you want to be running and what the rest of your set up is. You get 38% RMR from tree as a base and +5 from Amulet (which is mandatory for CI) then simply set up all your auras and keep adding RMR until you have enough mana. -Why Occultist, couldn't you do this similarly with Scion? Yes, for sure with Scion we would have easier pathing and more points to spend, However we would lose the ability to curse hex proof enemies, +1 curse from ascendancy and ES+Sustain from the Occultist. But you could do a very similar set up with Scion and similar items. It just comes out to the enchant that will save you the most %mana since haste is a 50% Reservation Aura that isn't in Chest. The next one that is almost as good is Discipline (IF its not in Shield), but that one is more expensive usually. So Haste is our best option. HOWEVER, given enough RMR you could swap out Enlighten on purities for a Level 4 Empower and get 20+3 Purities. -What kind of builds is this good with? All your standard builds that like having auras bots really. You Provide INSANE damage boosts. You I will be continuing to play and upgrade this character throughout the league character name: 'IBoostDPS' If i don't update guide with more information you can always look at the character for gear choices and upgrade paths for you.